If you’ve ever seen someone zipping by on an electric scooter, you’ve probably wondered what it would be like to ride one. Whether you saw a standing or a sitting version, they do look like a lot of fun. 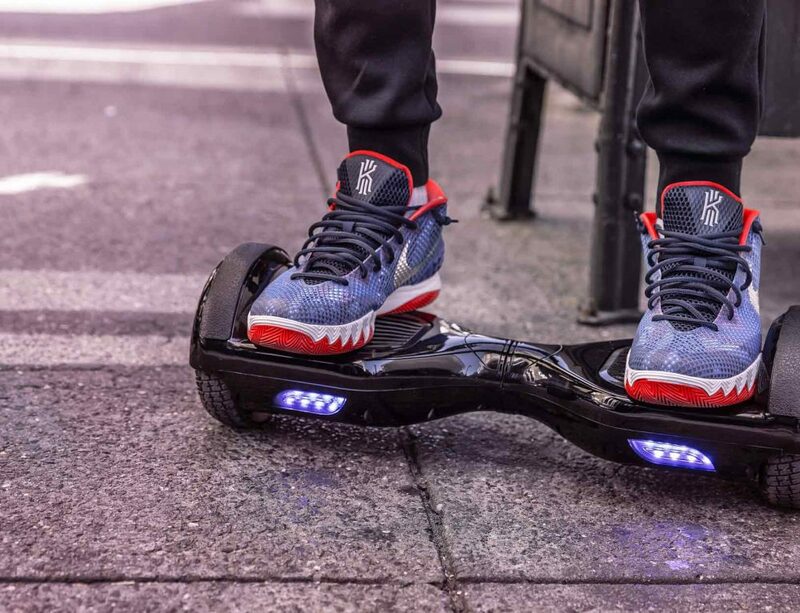 They also look easier to ride than things like motorized longboards or skateboards – and they are! But motorized scooters can be a lot more than just a fun toy to play around on. In fact, many people are using these as dedicated commute devices, or to get around in downtown areas after catching a cab or a bus. If that sounds like a stretch, consider that most electric scooters can travel anywhere from 10 to 25 miles per hour – plenty of speed for getting around in a pedestrian area! And they are much cheaper than operating a car. You don’t need gas, either – electric scooters are made to be plugged in. Most of the best electric scooters can operate on a single charge for about 40 to 45 minutes, or for up to 15 miles in many cases. All you need to know how to do is turn the steering column, and that’ s it! Want to know more about these cool vehicles? We’ve rounded up the top 11 electric scooters on the market right now, and put them to the test. Here’s what we found. 19.1 Where will you charge your scooter between commutes? 19.2 Does it really make a big difference on energy consumption? 19.3 Can a scooter work on every surface that you need it to? 19.4 You, and your scooter, will be exposed to the elements. Razor EcoSmart Metro Electric Scooter 4.5 18mph 220 lbs 15-20 miles Check on Amazon! Razor E300 Electric Scooter 4 15mph 220 lbs 40 minutes Check on Amazon! UBERSCOOT 1600 48volt Electric Scooter 4 26mph 265 lbs 12-18 miles Check on Amazon! GOTRAX GXL Commuting Electric Scooter 4 15.5mph 220 lbs 12.5 miles Check on Amazon! Ninebot Segway ES 2 Kick Scooter 4 15.5mph 220 lbs 15.5 miles Check on Amazon! Razor E300S Seated Electric Scooter 4 15mph 220 lbs 40 minutes Check on Amazon! URB-E Black Label Electric Folding Scooter 4 15mph 250 lbs 20 miles Check on Amazon! Razor E125 Electric Scooter 4.5 10mph 120 lbs 40 minutes Check on Amazon! Razor Pocket Mod Miniature Euro Electric Scooter 4 15mph 170 lbs 10 miles Check on Amazon! Razor E100 Electric Scooter 4 10mph 120 lbs 40 minutes Check on Amazon! 15 miles Check on Amazon! Quite frankly, if you want to capture a vintage bike vibe on your scooter, there is no other choice for you. The Razor EcoSmart has the coolest design of all these scooters, with its bamboo foot deck, powder-coated frame, and luggage rack in the back. It looks like an electric scooter designed by today’s top tech companies, and it also has one of the longest range times on this list. If you want to commute in style, without worrying about your scooter losing power halfway there, there’s no better choice. 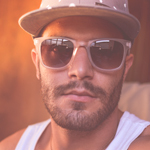 Another great bonus is the fact that this scooter comes at a more affordable price than others on this list. 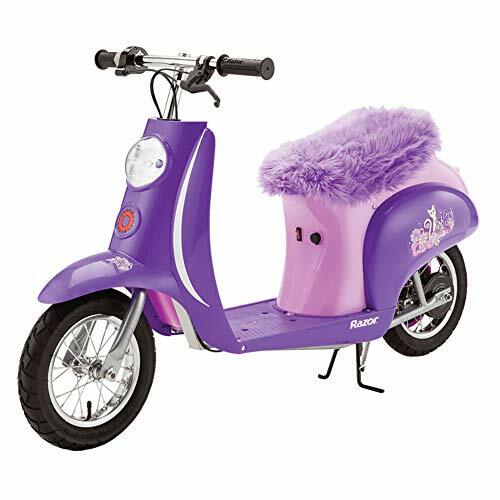 The biggest drawback we can see is that changing flat tires is a little complicated compared to other tires; but the payoff is a professional-looking scooter that doesn’t look like you’re riding your kid’s toy to work. This is one of the best selling electric kick scooters on the market at the moment. It is sturdy enough to hold a large adult, it gets a decent speed of up to 15 miles per hour, and it gives you a good 40 minutes of continuous use. This scooter offers a very smooth ride, and that it’s a lot lighter weight than other scooters made for adults. The only real drawback is the price, but considering the bump in weight limit, we think this one is worth the money. It’s a great all-around scooter for both commuting and recreation. 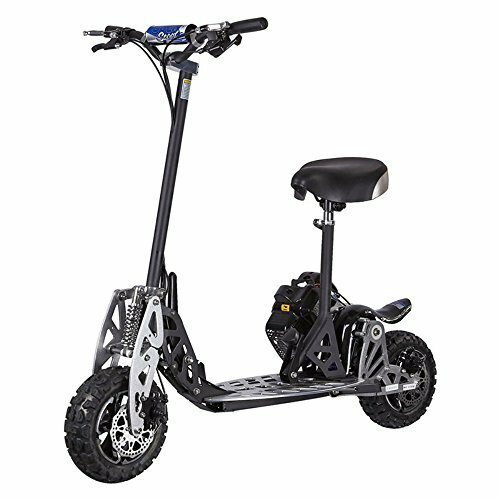 Made for adults, and offering one of the longer ranges in this group, the Uberscoot is a great choice if you have to travel on rough terrain or hills. 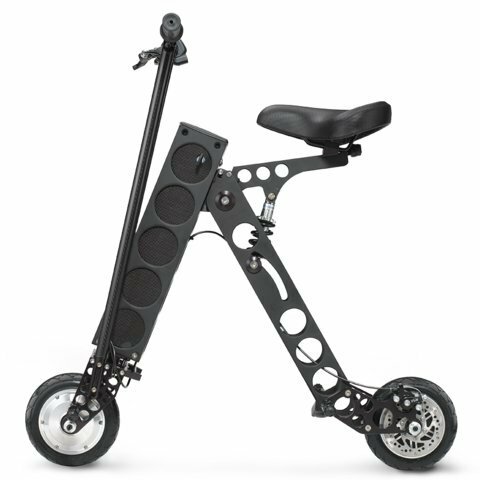 This foldable scooter is ideal for traveling part of the way by bus or cab, and then using your scooter to finish a commute or get around. It’s light enough to carry, and has a quick-release design that is easy to operate. It’s also one of the few scooters we reviewed with both front and rear lights, meaning you can use it safely and legally at night. Despite being billed as a foldable scooter, we do think this one is pretty bulky for carrying around on the bus for example; but keep in mind that the all-terrain tires are made for a sturdier ride, and will take up more room than the standard slim scooter tires. 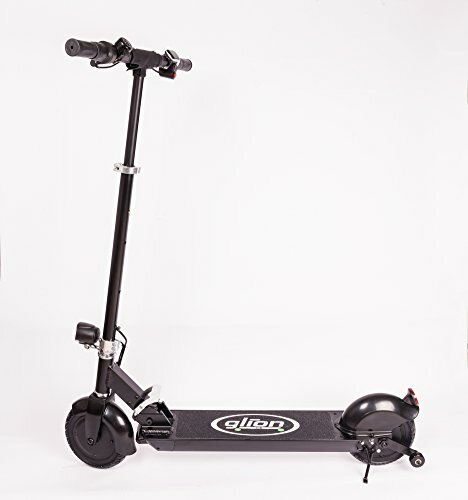 The GOTRAX GXL Commuting Electric Scooter is a highly durable scooter with 8.5” pneumatic tires capable of absorbing the shock of travel through the city and along sidewalks and streets. 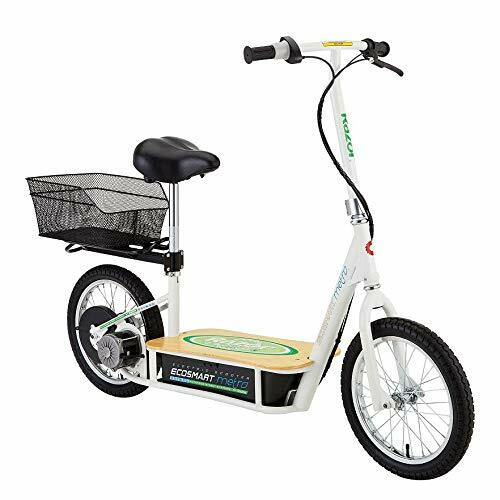 It has a 250W motor providing plenty of power and a 36v battery that can typically allow you to travel for 12.5 miles before needing a recharge. 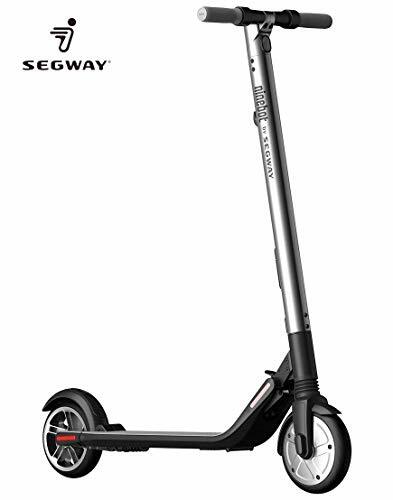 It can recharge fully in about four hours, too, making this a great little scooter for getting to work or school. The scooter is safe, as well. It has a front and a rear double braking system, an LED headlight, so you can ride at night, and a speedometer to let you know how fast you are going. The scooter has two gears, and in second gear it can go up to 15mph. You will also love that this a simple fold and release design for easy storage! Those who are searching for a fun and easy way to get around town, to commute to work, school, the gym, and more will want to consider the Ninebot Segway ES 2 Kick Scooter. 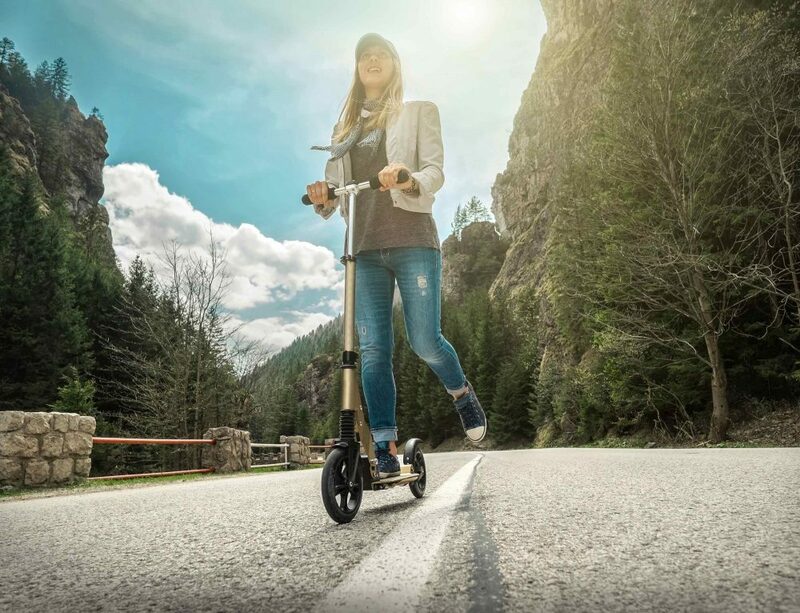 The scooter offers some fantastic features including Bluetooth connectivity along with a Bluetooth remote control. You can connect to the scooter’s app, as well, which can provide you with diagnostics regarding the condition of the scooter. It features an LED display that will show the driving speed, along with the power mode and the battery level. This machine has a double brake system along with shock absorption for added comfort and safety. There are front and rear LED lights to help ensure that you are visible when you are on the road in low light conditions. This scooter has a 15.5 mile range and 15.5mph top speed. It is foldable, easy to store, and an ideal solution for nearby commutes! Got a short, flat commute and don’t want to waste money on a car? The Razor E300S was made for just that situation. This is a seated version of the extremely popular E300, and comes with all the same pros. The powerful motor can get you where you need to be, and compared to other lightweight seated scooters, this one has quite a bit more power. It also has a very short charge time compared to other scooters – only 8 hours, where many of the others we reviewed need 14 or more. Be aware that this scooter is primarily for flat terrain. The pickup is very low, which is meant to help you feel more comfortable and balanced while riding – but ultimately results in hilly or rough terrain interrupting your ride. 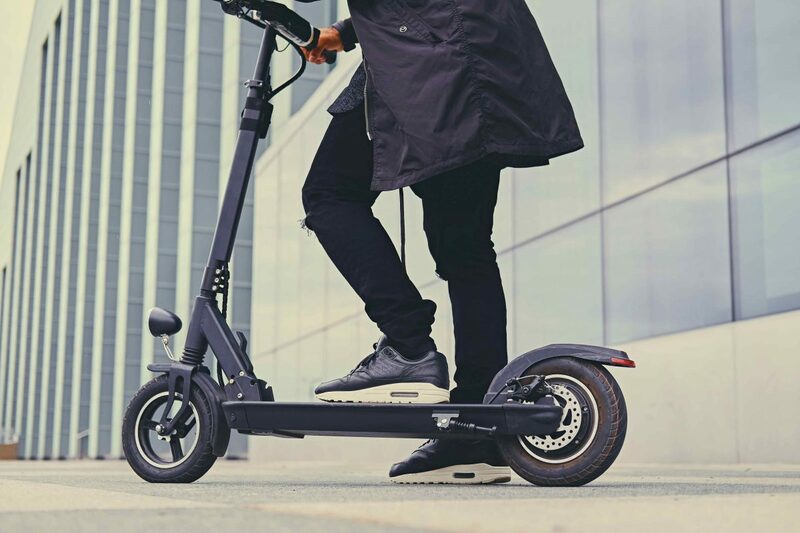 Another scooter designed for total portability, the URB-E Black Label is billed as the “future of transportation”. Designed by and for Millenials, this foldable scooter definitely has a cooler vibe than most of the scooters we’ve reviewed. The specs are pretty average for a top-of-the-line scooter, but one cool thing that the URB-E offers is a USB port that will charge your phone or tablet while you ride. This is one of the lighter adult scooters we’ve reviewed, coming in at 35 pounds, and the seat was designed to give you a low-to-the-ground ride without having an extremely low pickup that makes the ride bumpy. All in all, this is a solid choice for the young professional on the go who needs to take care of that final few miles of a commute, but doesn’t want to ride something that looks out of place in a trendy or professional area. 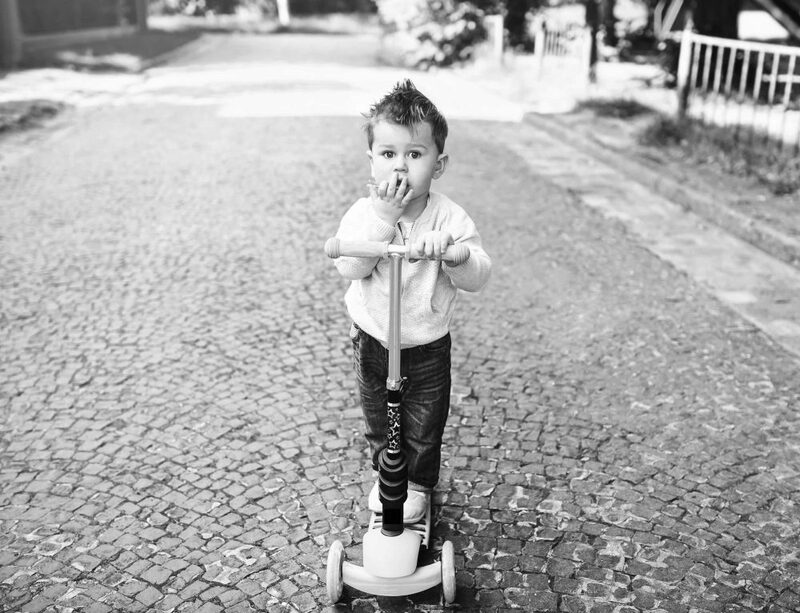 As one of Razor’s lighter scooters, this one is an ideal pick for older kids and tweens. 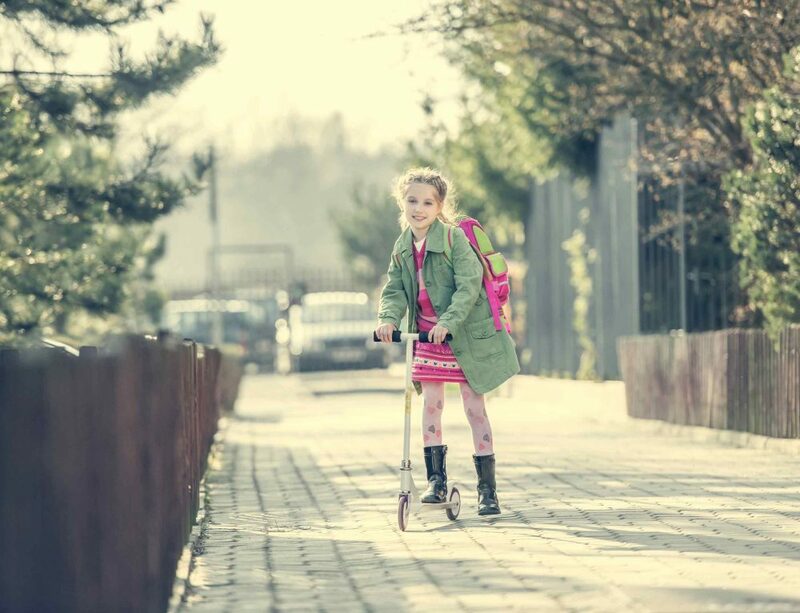 It isn’t the fastest scooter on our list, going only 10 miles per hour, but for kids, that’s more than they can do just pushing themselves. The battery offers a good 40 minutes of continuous cruising, which gives them enough to have some fun, but not enough to roam too far from home – a win win for both of you. The weight limit is the real winner on this scooter. It allows a small adult to ride as well, so not just your kid can enjoy it. The biggest con is that it doesn’t do well on hills – the motor will die on anything other than a flat route. You do have to push it up to about three miles per hour before the motor will kick on, but the good news here is that this scooter is also light enough to be used as a normal scooter without the charge. 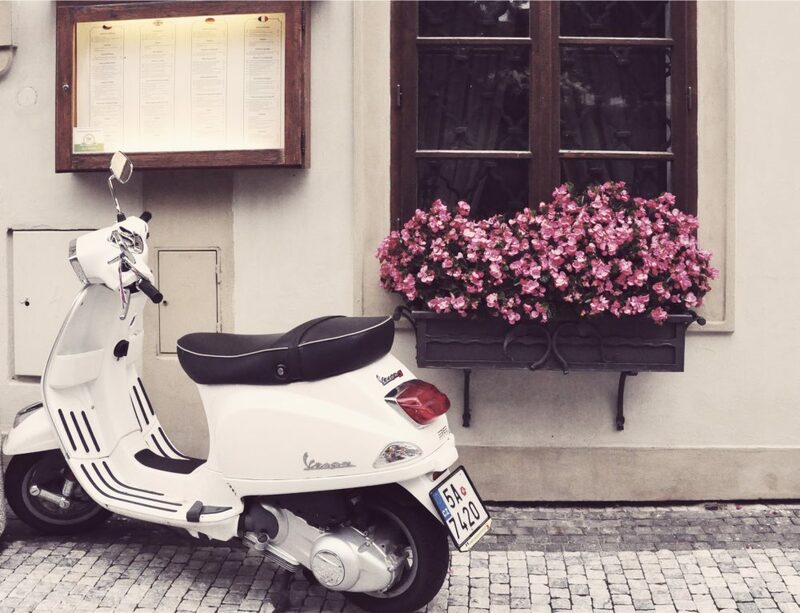 Want something that makes you think of Vespas and vintage scooters? The Razor Pocket Mod Mini Euro is your new best friend. It’s designed for anyone over the age of 13, and has a really awesome line of fun colors to choose from. It’s definitely both the most elegant and the easiest to ride in our line up. However, it only gets about 10 miles of range before the battery needs charging, and it takes quite a while for this scooter to accelerate. Pretty to look at, fun to ride, but not the most high-performance scooter we’ve reviewed, the Pocket Mod would be excellent as a gift for a teen who wants to ride over to friends’ houses on something that looks cool. 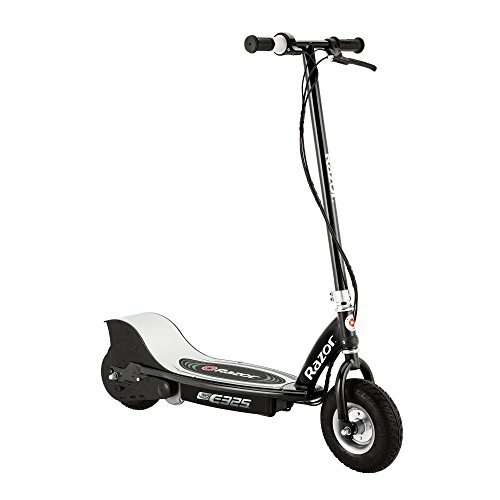 If you’re looking for a scooter for a child that still has some oomph, the Razor E100 is an excellent starter. 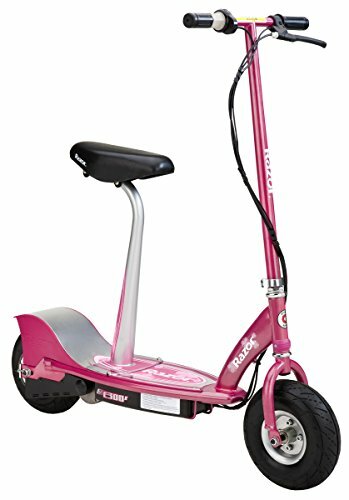 This scooter offers decent speed and range, but it keeps things to the lower end of Razor’s range to keep your kids safe. If it runs out of charge, it’s still light enough for kids to ride like a normal scooter. The only downside is that the motor can’t handle hills – it’s flat terrain only for this one unless you want to push it yourself. If you want something a little more powerful than the average electric scooter for kids, or you think your child might want to upgrade one day to a heavy-duty adult scooter, this is a great starter option from a well-known company in the scooter industry. If your goal is maximum portability so that you can go from bus, Uber, or cab, to the scooter, then the Glion Dolly-Fold is the choice for you. This is one of the most compact scooters we reviewed, but still offers all the power and capability you need to get around. A large adult can ride on this scooter, and it is also frequently reviewed as one of the quieter electric scooters out there. The sleek, minimal design of this scooter is a fan favorite as well, especially for professionals using this to get part of the way to work. It won’t make you look like you are riding a child’s toy, and it doesn’t look out of place in your office. Another big plus for the Glion is the fact that it gets a full charge in just 3.5 hours – the fastest of any that we’ve reviewed. Use it for your morning commute, charge in your office, then use it at night again. Because it’s a simple standing scooter, you don’t need to worry about age limits or moving vehicle laws. Overall, any of these top 11 electric scooters would be a convenient and easy way to get through your commute, run down to the store, get around campus, or simply to enjoy a drive in the open air. Choose the one that suits your lifestyle the best and have fun going anywhere!